That was the technique Jacqueline Kennedy Onassis used to captivate almost anyone, according to the author of a new book published a decade after her death. 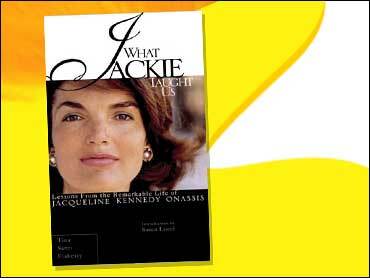 "Jackie perfected the lighthouse look: She had the ability to not only lock eyes with you, she had the ability to lock into your mind," said Tina Santi Flaherty, author of "What Jackie Taught Us: Lessons From the Remarkable Life of Jacqueline Kennedy Onassis" in a recent interview. And she tells The Early Show co-anchor Harry Smith, "Jackie laid out a remarkable road map for achievement. And if any one of us were to follow some of the things that she did, we could undoubtedly improve our own lives." As Jacqueline Kennedy, the author says, Onassis changed America's unsophisticated world image with culture, food, fashion and music, and restored tattered parts of the White House to make it "a living history lesson." "Before Jackie, America wasn't thought of as particularly sophisticated in literature, or poetry, or music, or art," Flaherty says. "We had it all along. We just had no one to showcase it. But Jackie did those magical White House evenings that let the world know America didn't have to take second place to anyone." In private, Onassis reversed her "very negative self-image" from a childhood filled with a torrent of criticisms from her mother, Janet Auchincloss. "Her mother was a perfectionist, and she wanted her daughter to be perfect in everything that she did," Flaherty says. "Jackie looked more like her father, which I'm sure didn't make her mother too happy, because her father was a notorious womanizer. She told Jackie that her feet were too big - size 10 - her hips were too wide, her eyes too far apart. It took her three and a half weeks to have a pair of glasses made, for example." Jackie's response was to grow into an icon of style and social allure, coached by her father, Jack Bouvier. Flaherty notes, "She did not have a perfect self-image, but she had a father who told her,'You're the prettiest little girl in the ring; men will love you.' So her father gave her a lot of self-confidence. She and her sister joked their father gave them vitamin 'P,' for praise." As we look back 10 years later, Flaherty notes people were impressed with the way she raised her children, drawing lessons others can learn from the late first lady as a mother. "She was a very hands-on mom and she believed in love, security and discipline without tears," Flaherty says, pointing out Onassis never used her children as props. "She allowed both Caroline and John their own individuality." Flaherty also highlights in her book Onassis' enormous courage in the face of adversity throughout her life that goes beyond the assassination of the president and his majestic funeral. She says, "For example, when Sen. Robert Kennedy was assassinated. Of course, she lost their two-day-old, Patrick, in less than 48 hours, their son. Even the way she met her own death. She met it with courage; she did it in her own way and on her own terms." Flaherty was her neighbor at 1040 Fifth Ave., and says she remembers everything from the day when Onassis died. She says, "I remember the mounds of flowers. I remember that I could hardly get in and out of the building because there were teams of people there. TV trucks, photographers, people from around the world. I remember a bomb squad dog there because there were so many celebrities coming in and out. I remember the sharp-shooters on the building trying to protect people in case there was an incident. Even in Central Park, there were undercover policemen dressed as clean-up people and so on ,to protect people. People were lighting shrines. People were praying. People were crying. I'll never forget that day. " The book, published by Perigee Books, was released in time for the anniversary of Onassis' death from cancer on May 19, 1994.